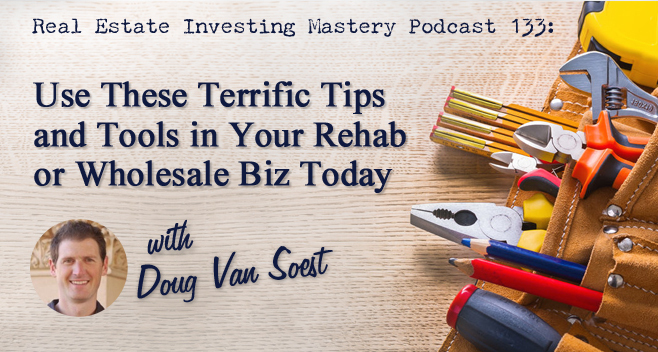 Welcome to another jam-packed episode of the Real Estate Investing Mastery Podcast. Today, Alex and I are talking with an investor who also happens to be a licensee of Alex’s 800-FAIR-OFFER program, Doug Van Soest. Doug and his wife, Andrea, are in business together in one of the toughest markets in the country, Southern California. He’ll explain how they’re able to be successful in such a competitive market, including which apps, software and sites they use, how they found their awesome VA and what she does, Doug’s theory on direct mail and loads more tips and tools you can implement in your own business today. Doug and Andrea apply all these strategies to both wholesale deals and fix and flips. Plus, Doug will also tell us his motive behind why they still pick up a few rental properties from time to time. We really do cover a ton of useful, actionable info in today’s episode… so get going. Joe: Hey everybody, welcome to the Real Estate Investing Mastery Podcast. We got a great show for you today. We’re going to be talking about a lot of cool stuff, but talking about doing deals, talking about marketing, talking about what’s going on in our businesses and what’s working today. That’s what this show is all about really, isn’t it Alex? What’s working today? Alex: Absolutely, not 20 years ago, but today. Joe: Right. You know speaking at that, I was the other day looking at an old course that I had. I say old it was done in like 2004. Alex: Which one was it? Joe: People even back then were still wholesaling deals and doing lease options. That’s 10 years ago, right? Alex: Absolutely, that’s… It’s all the basics right there from getting a property under contract, realizing the value of what you’ve captured and then selling that value. It’s all the same. Joe: Yeah, the principles of negotiating and talking to sellers. The idea, the radical concept of answering the phone and calling sellers back right away, that stuff. Joe: I can’t imagine that. But that stuff still works. In fact, I think Doug, one of our guests today, Doug, I think it was you, Doug, and I’m putting myself out on a limb here. We were talking earlier about… He’s hired somebody from the website, HireMyMom.com and she’s still working for Doug I think. We’ll talk about that in a minute. But yeah, he hired somebody from HireMyMom.com. It’s kind of like a virtual assistant, and if this isn’t Doug it’s somebody else. But now this person, this VA is answering the calls live and is actually making offers and negotiating with the sellers. So it’s… the basics is still there and the guys that I see, Alex, like you, like other friends that I have, who are still doing a lot of deals and are real successful in this business are good at the basic things, right? Alex: Absolutely, absolutely. I just sat down a couple of minutes ago and I was trying to outline my deals and try to get organized at where I’m at. And between what I have right now on the new construction side, rehab and under contract and permitting and developments, the number that I have of that there surprised me. Alex: Yeah, actually I have 24. Joe: What are you going to do with all that money besides pay a bunch of taxes? Alex: That’s what I’m going to do; I’m going to pay taxes. Joe: Let’s not talk about taxes; it’s too depressing. Alex: It’s coming. October 15th is coming. Joe: It’s too depressing. Let’s change the subject. Alex: Yeah, yeah, now we’re going to talk about making money and keeping it. Joe: Yeah, I have a friend, a guy I know, he was living in Switzerland or Sweden or some really expensive European country and he was being taxed on his income. At the end of the day, over 55% of his income was going to taxes. Joe: 55%. Those of you guys out there listening and you want us to become more like Europe. I’m just telling you have no idea what you’re asking for, right? Alex: God bless the USA. Joe: He just moved to United Arab Emirates. It’s like, “Well, why not? He’s got a wife and a couple of kids and not paying any taxes there,” so his business is virtual. He does it online. Alex: But he can’t live here. Joe: Right, right, right. Anyway, pay taxes to whom taxes are due. We get it. Alex: That’s right, that’s right. Joe: So good, Alex, guys at RealEstateInvestingMastery.com, RealEstateInvestingMastery.com, you get our Fast Cash Survival Kit. And I predict, Alex, that in 10 years as we’re looking back over these episodes and doing some work, as I’m still going to be doing them in 10 years. Looking back thinking, remember that course that we did? The Fast Cash Survival Kit? Well, guess what? It still works. You can hire virtual assistants to do your marketing. The postcards are still going to work 10 years from now as long as there’s still a postal service. Maybe we’ll have drones that are flying our mail to people’s houses. Alex: The virtual post office. Joe: We’ll have drones flying mail to people’s houses, but there still will be mail and people will still be opening up letters and reading postcards and calling. There’ll still be absentee landlords. There’ll still be motivated sellers. The principles of negotiating and talking to sellers and making offers will still be valid. The whole idea of finding buyers you know and finding out what those buyers want and selling your deals to them, that’ll still be around. They’ll still be doing it. So I might as well start now, right, Alex? I mean let’s just… Why wait any longer? There’s so much money to be made in this business right now. I mean, Alex, we’ve been in the business for a long time and I have seen I think in the last six months or so, more people like more students and clients, friends making tons of money in this business than I ever have before. Joe: Like I had a client, a coaching client sent me a testimonial just two days ago. I can’t use his name because he’s still working for this large corporation, but since we started working together since April to October, so how many months is that? 5 or 6 months. He’s made over $85,000 in assignment fees on deals. Joe: $85 grand! And he won’t quit his job. He’s got the golden handcuffs but he’s doing it part time, and he’s promised me as soon as he quits he’ll be on the podcast and we can interview him and talk about it. But man, like Doug our guest today is doing a bunch of things. Joe: Oh yeah, it is. I have a friend at church, he just did his second deal and I admit he’s a great guy but I’d be grudgingly agreed to help him. I was a little nervous. You know how it is, Alex, to get people that ask you all the time, “Can you help me? Can I take you out for coffee or whatever?” But you know what; he’s done two deals now. His first deal is like $2,400; his second deal… $6,800 bucks. Alex: Lease options or regular wholesale? Joe: No, no, just regular wholesaling and he’s hustling. He’s hustling and I just love it. I get so excited about this stuff. So real quick, you’re heading off to Sean Terry’s Flip 2 Freedom event. Alex: I know, so you can’t see me. I’m sorry. Joe: But you’re going to be talking about 1-800-FAIR-OFFER, right? Alex: One of the things, yup. Joe: Sean is making those sessions and recordings. Is he going to make those available, do you know? Alex: I think for certain people they will be available. I think the VIP people. Joe: Okay, so here is Sean’s cell phone number. Why don’t you call him and ask him if… I’ll give you Sean Terry’s cell phone number. Joe: And you can find or just contact their office or something, I don’t know. But send them a… In fact, if you’re here in Phoenix, just go to his Meetup group. He does these monthly meetups. If you want to bring deals to him, he’ll buy them all and find out if they are making those recordings available, because you get to hear Alex talk about virtual wholesaling, talk about FAIR-OFFER and the guy we’re interviewing today and he’s probably again like all of our guests really annoyed that he’s been waiting so long now listening to us jabber. His name is Doug; and Doug, how do you pronounce your last name? Doug: Van Soest. It does not look that way, but yeah, I don’t know how we get Soest out of that spelling. Doug: How many times you get called Joungblood over Youngblood? Alex: Oh, dude, I tell you every time and I really need to outsource this and I haven’t figured out a way to do it yet. But like I said, all these different projects that I have going on, how many times do I need to call the utility companies, you think? Alex: And how many times. Alex: It is what it is. Joe: All right. Well, Doug, you’re in… Where do you live? Southern California somewhere. Isn’t it all just one big city? Doug: Yeah, I live in Murrieta which is… You’ve heard of Temecula probably maybe? Doug: Yeah, Murrieta is basically the sister city. We’re just north of Temecula but we’re kind of one big metropolitan area now. Joe: I grew up in San Diego and I remember going to Temecula and it seems like you’re going way out in the country and it seemed like a really far away city and now you can pretty much drive to San Francisco and you feel like you never leave of a congested interstate. Doug: Yeah, so, I mean this place has just exploded since about the year 2000. Doug: And that’s probably around 250,000 people in the area now or so. Joe: And you’re doing deals in one of the most competitive markets in the United States which is crazy. Doug: Yeah, it sure it is. Joe: And you have the rights to 800-FAIR-OFFER and Riverside County and San Bernardino County, is that right? Doug: Yeah, Riverside County which is where we are, where I live, and in San Bernardino County is the county north of us. And those two counties make up the inland empire, most of it. Alex: That was one of our first people to sign on as a licensee. Doug: It was. I’m a card-carrying 800-FAIR-OFFER member and have been from the beginning. Joe: Why didn’t you get San Diego Country, was it not available? Doug: Actually, it was sold at that time, I believe. I think I tried to get it and it was already gone. Joe: What about Orange County. Doug: Same thing with Orange, I believe. At the time, LA, San Diego and Orange were all taken and those are the other three counties I would be interested in. Joe: Alex, do you have a waiting list or? Alex: Uh, you know what? I will look, because we’re going to be at the Sean Terry event giving people the opportunity if they want to be a licensee but I’ll look and see what we have available right now and if you’re interested, Doug, I’ll let you know. Joe: Well, and Alex, if somebody listens to this podcast and wants more information about 800-FAIR-OFFER, do you have a website that they can go to or? Alex: Absolutely, so you can check if your County is available by going to the page, 1800FAIROFFER.com/register. And on that page you have a dropdown menu and it’ll show you what’s available and what’s not. Joe: Yeah, that’s good. I was looking to go into a market and I was talking to Alex of course. It was a pretty big county that wasn’t available but there are a lot of counties out there that are still available and you never know. If the county is not available, you could maybe put your name on a waiting list or just… Here’s Alex’s cell phone number; I’ll give it you here and you can call him and ask him to… Just send him a text message every day but… So okay, now Doug, Spouses Flipping Houses. You’re married to Andrea, right? Did I pronounce that right? Doug: Yeah, Andrea. You see, when she married me and she gets it both ways as well. She gets Andrea Van Soest and it’s Andrea Van Soest. Joe: Andrea, okay. So you guys work together, is that right? Doug: We do, yeah. We’ve been working together since we started flipping houses in 2008. Joe: And you have kids, which is crazy. Alex: It’s crazy that they have kids and are working together. Joe: Well, anybody who has more than three kids is crazy, which is all three of us. Doug: We’re still married; it’s awesome. Joe: Honestly though, it always bugs me when people complain about their kids and I don’t think you’ll ever catch me complaining about my kids for the most part intentionally, okay? But kids are so awesome. I think they are a blessing from God and I love it when I hear people talk about their kids. So congratulations to you, Doug, for having three kids and hopefully maybe you have a few more, huh? Doug: No, we’re done with that. But three kids, we love them to death. They’re still young; our oldest has just turned 12. But we have a 9 year old and a 5 year old and they keep us busy. Joe: Good, good. So you work with your wife. How do you guys do that? How do you handle it? Doug: Well, lot of years of experience. Actually, when we got married, we immediately within six months quit our jobs. At that time, we had corporate normal jobs and we quit our jobs to go start a kettle corn business together. You’ve had kettle corn before? Joe: This must have been your idea. Doug: Well, it was both of ours. Doug: Here’s what happened. A good friend of ours gave us that book Rich Dad Poor Dad. It’s so common and so that was the end of it right there. We read that book and completely shifted our mindset on finances and our future and investing and working for the man if you will. And so yeah, we had a friend who has a side job had bought these kettle corn kettles, these big pots and he was popping kettle corn and selling them at all these farmers markets and events and festivals and things and he was making more money than he was making in Costco, that’s where he was working at the time. And we just thought, “Wow, opportunity!” So we said, “Hey, if you’ll teach us everything you know…” This was in San Diego by the way, “Teach us everything you know. We will move out of state and we won’t compete with you but we want to do this somewhere else,” and he did. And so we bought a kettle, we moved to Colorado, moved in with my brother in his basement. Joe: So it was a success. It must have been her idea. Doug: Yeah, it was her idea, absolutely, because it worked. Joe: Well, that’s cool. What did they teach you? Go ahead, Alex. Alex: I don’t always eat kettle corn, but when I do I eat so much that I wish I hadn’t eaten it. Joe: That’s a tweetable right there. Alex: Oh, popcorn with sugar mixed in. Joe: Yeah, sugar coating it, sugar popcorn, that’s funny. Doug: And the markup on popcorn, “Hey, that’s pretty good,” right? Joe: So were you actually making decent money in that business? Doug: I mean yeah, for a newly married couple with very little expenses. We worked probably 3 or 4 days a week, mostly weekends. We take Monday, Tuesday and Wednesday off but it was hard work. I mean we worked really hard when we did but we made a good living for ourselves and absolutely loved doing it. The carny life wasn’t so bad. Joe: All right. What did you learn about business from doing that, that may be helped you in real estate? Doug: If you’re lucky. And if you’re really lucky, maybe you shift positions and get another corporate job with another set salary, and not that every position is that way but that’s the path we’re on. And by opening our own business, I mean it just opened our eyes to, “Hey, if we can do this, everything we make is ours and there’s no limits to that. How hard can we work? What else… What are contracts can we get? What other biz can we open up?” Just that little mindset shift there, but we always wanted to get into real estate; we kind of knew that. And so when we sold the business and came back to San Diego, I got my appraisers license. Andrea got her real estate license and we just started. Joe: Which year was this? Doug: This was late 2002. Doug: So early 2003 I was an apprentice appraiser learning about real estate and that’s when I mean things were really rocking and rolling over the nationwide but especially in Southern California. Yeah, so I appraised houses actually from 2003 all the way to 2010 before I did my last appraisal. Joe: Okay, and you made good money doing that? Doug: Yeah, yeah, made good money. It was… really busy, lot of purchases, lot of refinances that whole time. Things started to change around obviously 2008, 2009 when everything crashed. There was also some legislation that went in regulating who could hire the appraisers and how that went and that really changed the industry. I really wouldn’t recommend getting into it today other than to learn. If you want to learn, that’s great. But they created a middleman between the client and the appraiser to kind of regulate some of that and they cut out half the profits for the most part. Joe: Well, but you learned some pretty valuable skills I’d imagine and how to… You became real familiar with neighborhoods, with how to determine comps, how to evaluate properties. Doug: Yeah, so I think that was… It was super valuable for me and for getting into eventually flipping houses but it was interesting. It wasn’t until we flipped our first house and actually sold it in 2008 that I realized that appraisers don’t really think like investors think. And I became a way better appraiser after having flipped that house or two, just realizing how the market actually reacts to a product, to a fixed house. And so I just considered myself a much better appraiser after that. Of course, I quit shortly thereafter. But even today, every time I analyze a deal, I’m looking at it from the perspective of what is an appraiser going to look, how’s an appraiser going to look at this property. I think it’s worth… I have to think so many people would come and pay this amount of money for it, but if it doesn’t appraise for that it’s not going to sell for that. So you have to analyze a deal with that perspective in mind unless you’re in some kind of a special market where it’s cash deals only or something. Joe: For sure, okay. And so what did you guys do? You started flipping houses I guess you said in 2008. That was right when the market was collapsing, all right? Doug: So yeah, so the market was actually falling out of the sky about that time. And really we started making offers in early 2008 and we’d gone to some seminars and we’d taken some education and really if you want to go way back, the whole reason we actually got into investing was from a podcast. I listened to… Joe, you know the name of it with Judson Voss? Doug: Get Real Real Estate Investing, yeah. Get Real Real Estate Investing kind of turned us on to the world of real estate investor clubs. And so we searched that, found out some of those, and just started attending these monthly meetings and learning and doing what we could. But we started making offers just on the MLS, on bank-owned homes in early 2008, and just about quit because we didn’t get a single acceptance for about nine months. We made dozens of offers and we were just getting really frustrated and finally got an acceptance in August of 2008. And the reason we didn’t get any acceptance is I mean we knew the market was dropping about 5% every month. It was just crashing and so we had to kind of figure that by the time we resell this house it maybe 10%, 15% lower than what I think it is today. So we were being conservative; we didn’t want get ourselves in trouble on our first deal. And so that’s kind of how we approached but we got that acceptance in late 2008. We flipped the house; we made some good profit on it. And I knew immediately after that that, “Oh, this is what we’re going to do. This business actually works. We’re going to go full-time flipping homes,” and we bought two more later in that year and it’s just kind of grown since then. We’ve never looked back. Joe: All right. So even when the market was falling, were you having a hard time selling your properties to retail buyers? Or were you doing more wholesaling at that time selling to investors? Doug: No, we weren’t doing wholesaling then, and we didn’t really have a problem selling our house because we fixed it correct. We knew that we needed it to be the best house in that price range. If somebody’s going to be shopping for a house all things being equal and our prices are normal to everybody else, ours is going to be the best. It’s going to look the best, have the nicest fixtures and features and it’ll be the obvious choice. And for the most part, they would sell within a week or two weeks. Doug: It is going to. Joe: Well, it is, for sure. But the markets don’t; it’s not like the stock market where it stops and changes on a dime. I mean literally overnight the market can change. Joe: It’s gradual throughout the state, right? Doug: You’re not going to go from a house being worth $200 to $110 in overnight. Joe: Right, exactly. So it’s really important to watch the market. And this is why, Doug, I think you’re so successful even when the market was tanking and selling properties as you knew what your buyers would want. You knew what they wanted and you knew what they would pay for those properties. And so you just kept on making offers at numbers that worked where if you sold it, you would make your money conservatively, I’m assuming. Is that right? Doug: Yeah, absolutely. I think the numbers on our first house were… We bought it for like $163 and I think it’s about $35,000 rehab and we sold it for $280 or somewhere in that range. So it worked out really well. We were pretty conservative. But when you have a fixed house, that is the best thing around. Even though there were a lot of homes for sale, this one was the move-in ready one. It made the obvious choice. And the location was good; it was a desirable neighborhood. It was a desirable house. Joe: Good, good. All right. So what have you been doing since then? Since those first few houses you sold, you’ve seen the market come roaring back again in Southern California. Now the complaint I’m hearing from people down there is, “It’s too competitive. I can’t find any deals. My response rate is only like half of a half of 1%. I have to spend like $10,000.” Well, not that much but I have guys that are doing deals, they’re spending like $5 grand in marketing for each deal that they get. So what is it like for you right now? Doug: Yeah, that’s kind of been the reality of the direct mail world that I’ve noticed here. Maybe half a percent on an average is your response rate, but you talked about people complaining of competition and I don’t remember at any time since I’ve been in this business that somebody wasn’t complaining about something. Doug: It was, “Prices were too low, too many foreclosures, not enough foreclosures, financing is too difficult to get. It’s too competitive, too many other investors out there.” There’s always something and I find myself having those thoughts obviously occasionally here and there too. But I mean we just try to stay positive and keep trying to find out where the cheese moved and just keep being consistent. There was a point last summer where I think we went like a month and we didn’t have any deals, which for us at that time we’re normally getting two or three deals a month. And actually, I was talking to Todd Toback and we had sent out probably 10,000 mailers the month before and I said, “Todd, we’re getting no deals and very little response,” thinking about shifting gears and doing something different. And he just kind of gave me the advice that, “You know what? Now’s when you push harder. Now’s when you double that mailer next month and I bet you you’ll have good results.” And sure enough I’m glad I listened to him. We did that very thing and had a really good next few months as far as deal flow. Joe: You know why I think that works? Doug: They don’t work that way every time. Joe: I think that works, Doug, because a lot of other people are complaining about the same thing at that point, and then they quit. And then sure enough what happens after that, you’re the last guy standing and you’re now getting all the deals when they quit and walked away from it. For some reason, maybe we can’t explain it but the market goes in little cycles like that. Maybe there were a bunch of seminars the previous month that ton of new investors came in and started sending out a ton of direct mail. Maybe Toback was flooding the market himself with his own direct mail, right? And you both were flooding it at the same time, but if you stick with it man it’s going to come around. I see that so many times. That’s good. All right. Joe: So what are you doing these days mostly? 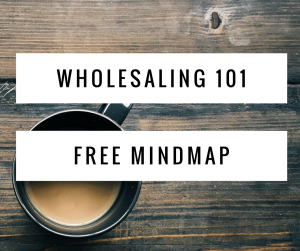 Are you rehabbing or are you doing any wholesaling? Doug: So yeah, we do all three. We rehab and resell. It’s a typical fix and flip. We wholesale, which probably about 50% of the stuff that comes across our desk that we get a contract on, we’re going to wholesale it. And then we pick and choose rental properties. So our goal all along has been to collect a good pile of rental properties for long-term retirement and equity growth here in South Cal. I’m so glad we did that. But we don’t buy as many anymore because the prices are a little higher but we still pick up a few rental properties as well. Joe: What part of Virginia? Doug: She lives in Winchester. Joe: It’s not your mom. Is it, Alex? Alex: It is not my mom, okay? My mom lives in Long Island, New York. Joe: Ah, okay. Now Doug got a lady with a nice Southern accent. Doug: She does have a little accent. Luckily for me, she has some real estate experience. She used to be an agent back in the day. Doug: But long story short, almost two years ago now, I just decided to ask her one day because she’s always good on the phone, seemed to be really engaged with working with us and just offered her, “Hey, you want to start taking some calls for us and try to negotiate and set up some appointments?” That was kind of my first thought, set up some appointments for me and she did. So we kind of put her on. And real soon, she just started negotiating the deals herself virtually from Virginia here in Southern California. And she’s still with us today. She’s amazing and keeps pumping out deals. In fact, she got three this week I think which is a good week. Joe: I can hear people kind of adjusting in their chairs and leaning forward because like, “You’re doing what! ?” So you’ve got a virtual assistant from HireMyMom.com. She had some real estate experience and she’s now… So you’re doing the marketing. She’s taking the calls live or just returning the voice mails or what? Doug: She is… 95% of our calls go to a voice mail. She’s returning the calls. Joe: All right, pretty quickly? Doug: As quick as possible. Doug: We do have… Like our internet leads, when somebody calls from the website, those link directly and they go right to her phone and she is instructed to answer that call if she possible can and when she sees a web lead come through the system as a voice mail or something or online, she’s get that. That’s a priority. She’ll get back to that one as soon as possible. Joe: Yeah, good, good. And so she works for you full-time? Doug: She works full-time, yeah. We never met her in person. Doug: But just… We talk a lot of times though, on the phone. Alex: We know about that, Joe. Joe: Yeah we know. I don’t like meeting people in person, even people in St. Louis don’t get to meet me but… All right. So this is really cool because you’ve been equipping her to make… She’s making more money because you’re giving her bonuses, right? You’re paying her hourly and she’s getting like a bonus for every deal, is that true? Doug: Right, yes. We pay her kind of a base salary and plus commissions per deal, so the more deals she gets per month the more she’ll make per deal. Doug: We’ve kind of played with some different structures and we try to mix it around. But I just gave her a little raise a few months ago on the bonuses and probably we’ll be doing that again shortly. And if she’s listening to this, I guess I have to do it now. Joe: Right, right. So then she’s actually negotiating these deals and getting them under contract for you on the phone. Doug: She’ll negotiate the deal. Obviously, I trained her to do the best desktop analysis as possible, ask the right questions, get on Google Street View, all those things, do your Redfin comps and try to negotiate a price. And then as soon as we have the property under contract, we’ll go out and inspect it. She has to verify that we are where we are. Joe: Sure, sure. And a lot of people don’t think you can really actually negotiate deals on the phone but she’s doing it. And you can always; you still have the inspection period where you can go and get the properties, inspect them, right? If you don’t mind me asking, in Southern California because it is a hot market and prices are still appreciating compared to the rest of the country pretty good, what? Are you using the standard typical 70% of mail or does that not work in Southern California? Doug: No, that pretty much doesn’t work for the most part. We had to kind of a… That was how we were offering initially when we began. That or maybe 65% minus the repairs. Right now, we can sell a wholesale house that the buyers out there are paying about $0.80 less repairs. Doug: So that’s kind of the going number depending on where you are. It goes down a little bit if you get to kind of some outskirt areas. So we’re trying to just build in a profit margin in there so we’re probably on average offering around 75 less repairs. It really varies depending on the neighborhood but that for the most part would be a good offer comes in it. But because he has such good buyers and he knows what they’ll buy, they’re buying at $0.85 to $0.90 on the dollar sometimes, right? And because he knows that and he’s also very focused on a few key zip codes; I want to ask you about that in a minute here; but he’s able to go in. He doesn’t have to negotiate that much. He doesn’t have to negotiate that far. It’s not like trying to get $0.40 to $0.50 on the dollar and trying to get a ton of equity. When you’ve got good buyers that you know would pick up properties at $0.80 on the dollar minus repairs, that becomes a whole lot easier to negotiate. Am I right? Doug: Yeah, yeah, having a reliable buyer that you know wants to buy a lot of properties and after a while you figure out this is kind of the number they can pay; it makes it a lot easier. You know where to begin; you know where you can end your negotiation. And the better negotiator you are, I guess the better profit you’ll get there. Joe: All right. So what does that look like for you then, Doug? Doug: Well, we do focus primarily on the Inland Empire and that’s our bread and butter market right here. But we market in some form or another to almost all of Southern California from San Diego to East L.A. area. Joe: When you say inheritance lists, are you talking like a list…? Doug: Talking about US Leads List. Joe: Yeah, yeah. Okay, yeah, that’s what I’d understand. Doug: Yeah, Sean Terry told me about that one in the beginning and still one of our better performing lists out there. Doug: Yeah, it is. I think 3 or 4 now? Alex: Well, it may be 3. I don’t know. Doug: Yeah, it’s something like that, 3 or 4 per zip code is what they’ll sell it to, so we have a lot of the areas here in Southern California. Doug: So we do that. Internet has actually become one of our favorite lead sources. We still do a lot of mail but we get a lot of traffic. A guy I hired a little while ago who has built us our site and has been optimizing it for SEO, which is about as far as I go in my technical knowledge of how that works. But we don’t do Pay-Per-Click; it’s all organic search, and we probably get 5 to 7, 8 leads a week or so. Doug: Organic, yeah. Not that every lead is great; a lot of them are listed; a lot of them are just at it, but there’s some definitely good leads in there so that’s one of my favorites right now. Joe: I’m surprised to hear that but that’s good. Now when you are sending direct mail, what are you sending? Just text, postcards or letters or? Doug: So primarily right now I’m sending letters and they are a yellow-letter style but they say more than just ‘We’ll buy your house for cash.” It’s a handwritten letter essentially that goes into a little more detail. I get some of the mail too so… I’ve tried it all. We do postcards; we do handwritten letters invitation style. We do a lot of different things but right now we’re pretty much just sending out handwritten letters that are in a standard #10 envelope for the most part. Joe: I was just on Facebook. I was paying attention but I was just on Facebook and this guy posted a picture of a seller, a friend of mine from our mastermind. It’s a posting of a picture of a seller signing the HUD at the title company. The seller actually brought to closing all of the postcards he had received from this guy and there were 7 postcards laid out on the table. As he’s right there in front of him, he’s signing the HUD. And each postcard was different and the guy made the comment. He said, “Follow up, follow up, follow up.” This guy had received 6 or 7 postcards and a lot of phone calls from him back and forth and sure enough here he was sitting down closing the deal. So I don’t think it matters necessarily what kind of mail you’re sending as long as you’re sending a lot of it over and over again. Doug: Yeah, in my experience, people will respond to all of it. I mean you may get different people responding to different types of mailers which is really why I like having the 1-800-FAIR-OFFER angle as well. But for the most part, it all works. I mean you just got to get out there and get it out there and be sending it on a consistent basis. That works. Joe: So Doug, if somebody was new and they contacted you and you’re going to train them on how to do deals of a competitive market like Southern California and they didn’t have a whole lot of money. Let’s say they had a $1,000 a month to spend on marketing. What would you tell them to do and where would you tell them to start with? Doug: If they were here in Southern California, I’d tell them to: #1. Listen to as many Podcasts as possible. It’s free. You can do it while you’re driving around, working out, create education available, free education available out there in podcasts. Probably if they had only like a $1,000, I would steer them towards driving for dollars, fixing neighborhoods. That seem to be good… older neighborhoods probably. They don’t have to be the best neighborhood but an area that lot of sales are happening, and drive up and down look for vacant properties, look for properties that appear to rundown. If you see neighbors out, talk to them. You’re just looking for addresses; you’re looking for leads to just sort of build your own list. And then I would mail to those people. So it’s not an outrageous amount, maybe you get 500 names. Start sending letters to those people. That’s what I do. I still think that’s a great way to get deals. Joe: Interesting. I’ve never driven for dollars before. Have you, Alex? Alex: Driving for dollars… Oh, yeah, actually I’ve gone locally. I mean I don’t say I’m going to set out and drive around looking for houses. This is maybe back in 2002. Joe: I tell you cough button. Joe: Cool. Yeah, I’ve heard of guys that actually would train bird dogs. They have really concentrated marketing campaigns to get bird dogs to drive around looking for vacant properties. Doug: Yeah, that’s the route that I would go personally. I’ve never specifically driven for dollars as a… Like I haven’t scheduled a day like I’m going to drive for dollars today. I’ve done it one occasion driving around to different houses we have, but we have landed deals that way. So I think the best way is to be… yeah, hire somebody who’s going to go do that for you, and then you can send out the mailers and give them some money if you buy a house or something like that. Joe: Yeah. All right. So they would… You train them to go drive for dollars and send mail to those vacant properties, vacant looking properties. Is that it? Would you have them do anything else? Doug: No, I would have them go Craigslist and start e-mailing, calling, texting. Everybody who’s advertising a property or looks like a for sale by owner type out the listing. Also, I think where your advocate job, I would go after the people who are listing houses for rent and contact them and see if they’re interested in selling. Definitely deals on Craigslist, just like anything, you’ve got to work for it. But it’s free, it just takes time. So if you’re on a low budget and you’re just starting out, I’d go there too. In Southern California, I would stay off the MLS, I really would right now. It wouldn’t have been the case in 2008 and 2009 but right now anything on the MLS has so many offers. Not that there aren’t deals there but really the deals that are there come from some kind of an inside relationship or heads up on that other people didn’t know about. It’s hard to just go to the MLS and start making offers and get anything worthwhile right now. But another thing, I would just follow up. I think you mentioned follow up earlier. Follow up has been really huge, a game changer for us as well. We implemented Podio, Joe. Joe: Which by the way, who told Sean Terry about Podio? Doug: I’m guessing you did. Alex: Oh, that was me. Joe: No, he wasn’t. Anyway sorry, but yeah you were using Podio. And how are you using Podio? How has it made a difference in your business? Alex: How do you integrate the voice mail? Doug: So Carl Loop, CarlLoop.com. I believe that’s it. Joe: Yeah, are you using Zapier with that too? Doug: We are not. I’m sure you can do that. I’ve not set up a Zapier with it but what we’re doing right now is just exporting an Excel every month of all our leads and then importing them into CarlLoop and into the system. Joe: Oh, okay. All right. So you are having it do it that way, okay. Doug: I tell you, sometimes the best automation… I was just talking about this today. The best automation you can have is a good VA, right? And so once a month, you set up a recurring task for your VA, export all of your old leads and send them a text, send them a voice message and send them something in the mail, right? Joe: Just have a VA do it. Cool, I love that. Doug: Yeah, I have my assistant do it so I’m not the one doing it, but yeah it happens every month. It’s follow up as huge especially when you start. Joe: Yeah, what leads…? Does everybody in the database or people that are at a certain point in your lead flow or how do you do that? Doug: Yeah, it’s usually if they’re categorized… I mean we have a certain button for the status of that lead. And all the active leads, we are still actively working with them or actively negotiating and nothing has been determined yet, those we’re still contacting personally on occasion. But if you get into the point where you’ve tried to reach them a few times and you’re just not getting a response or you’ve made an offer and they just refused it because it was too low or whatever reason, then they got into the follow up status. And once they’re labeled to follow up status, that’s the category we’re going to take all those leads and like start getting indoor follow-up system that way. Doug: Yeah, and Podio has just been amazing for that. It’s free up to five users or so. It’s been unbelievable. Joe: I think it’s owned by Citrix. But there if you just Google ‘GlobiFlow RightSignature,’ and there’s a way that they’ll show you in there, and we also have this in our RealAutomation.biz stuff. There’s a way that you can actually from Podio email a contract to a seller through RightSignature. The seller, if they sign it, that attachment will automatically be attached into Podio and you can create a task for yourself to go get it and follow up, etc. So unlike the other electronic signatures out there, that stuff will send out for you, but if it still comes back you have to go look for it and bring it back into Podio. But with RightSignature, it automatically brings it back into Podio for you. It’s really cool. Now I wanted to ask you too, Doug, how are you doing? Like if a seller is not motivated or not ready to do a deal, are you still sending them an offer? Doug: Yes, we send an offer nearly every seller that calls in. And I say nearly because there are some that are so far off in their expectation or it’s somebody who we just want to offend to be honest with our low offers. So probably 80% or 90% of the leads definitely get an offer because it’s just a click of a button. Just like you said, we’ve got 5 or 6 ways to send offers and it’s you just click the button, like email an offer and it will populate fields in Podio. Yeah, it goes out immediately. Or even mail an offer, send it to our person who’s going to print and put it in the envelope. And it’s so easy to do it and save so much time, so definitely you can send an offer. Alex: The whole Click2Mail, that thing works actually pretty cool. I don’t know if you knew about that where you could set it up in Podio to send to Click2Mail, email to mail and it will set up a whole envelope. You just have to approve it and it will go out in the mail. Doug: You still have to approve it? Alex: Yeah. Well, I put it so you would have to approve it. Yeah. Joe: Well, Click2Maill has a feature called e-mail to mail. And basically, you have GlobiFlow create the contract for you, and then email it to email-to-mail’s email address. And then… as long as it’s coming from one of your approved email addresses, then they’ll print the attachments and actually mail it to whoever’s in the subject line. Doug: Another way we use Podio for those who are actually rehabbing properties out there, we set up a whole workspace, like a design workspace with our contractor so that… My wife is a designer and she’ll… She set ups different items for every piece of tile, every piece of carpet, every paint color, every granite color that we use and all she has to do is when that project goes in there is just click on the colors, click on the tiles that she wants for that project and our contractors working in there with her and he can update her on the status, and they can communicate back and forth through there. That makes it really a good system. Joe: That’s cool. That’s really cool actually. So you’re managing your new rehabs. And so you’ve preselected the colors and the finishes and stuff like that in there. Doug: Right. Yeah, we just set those up as items and we have an item app. And in there is different categories of paint or flooring or if you do a lot of rehabs and I think we have about 10 or 12 going right now, sometimes it gets to be a lot. And you need some kind of organization system to communicate back and forth and not only that but it’s there for everyone to see and it’s sort of an accountability like, Now look, it shows this tile, not this one. Joe: Boom! That is why I love Podio so much because… I’m not going to knock any other system because they’re good. In fact, FreedomSoft is coming out with an updated version. Our buddy and friend, Rob Swanson has done some amazing things to make it better and more improved. And I will tell this even if he was here, you can’t customize it like you can with Podio. So let’s say you’re rehabbing deals or you’re collecting… Your hobby is collecting… I’m just looking right now at this… I drink coffee at Starbucks and they stick these things inside the cup so it doesn’t spill. You know what those things are? Anyway, spill stoppers. Let’s say you collect spill stoppers and you want to create some kind of way to track how many that you’ve collected every day and from what Starbucks and from what city and the dates and what the weather was like when you collected these things and what kind of coffee you got with it. Well, guess what? You can go into Podio and build an app that tracks all of that stuff for you. And let’s say you want to publish it with all of your other friends that have weird hobbies, and then they can all see what you’re doing and you can share each other’s exciting stories. And that’s something that you can do in Podio, right? And anybody who is looking at and hearing us talk about Podio and you have no idea, just go to Podio.com, sign up for a free account, go to YouTube and look up some videos. My business partner, Dan and I have a little business called Real Automation, RealAutomation.biz get some information about what we’re doing there with Podio and we’ve custom-built a lot of different apps and workspaces but it’s really powerful and once you learn it, it’s so simple. You can start creating anything you want out of it. Joe: Yeah, that’s BS, I don’t know if I believe those numbers but I know you’re saving. You do save a lot of time if it’s really that much. Yeah, maybe. But okay Doug, listen, you’re coming out with a podcast real soon. What’s it called? Doug: Yes, Spouses Flipping Houses. Doug: That’s the name of it. It’s my wife and I.
Joe: It sounds like and HGTV show or something. Doug: It does. I like the name. I hope everybody likes it, it’s kind of catchy. Yeah, podcasts have been such a huge part of our education and we love this even today. I’ve got a dozen podcast I’m listening to all the time for real estate, for business entrepreneurship and we just, we thought it would be fun to do it. We have a little more time now. Who knows what opportunities may come from it? Deals, just other connections we may have, I don’t know. Hopefully, people will listen but we’re in the process of… We’ve got one episode now and by the time this podcast airs, we should have you know four or five out there, but yeah, Spouses Flipping Houses. Joe: I love it, I love it. And what’s going to be kind of the focus of it? Doug: So it’ll be real estate investing, business entrepreneurship but with the specific niche of those who want to do it together as a spouse or with a loved one, brother with a father or son. There are a lot of people who are out there trying to do this business for somebody else who is not just a partner but actually a family member or someone who you love. And there are a lot of dynamics that have to be learned and addressed and thought about. When Andrea and I speak at different clubs on occasion, the biggest questions we always get is, “How do you guys do this together as a married couple and not kill each other?” and “How do you balance your marriage and your business life and all that?” so it’s a big topic and we like talking about it and hopefully we have some experience and some things to offer in that regard. Yeah. Joe: Well, very good, I think it’s going to be a good success because it’s unique and nobody else is really kind of talking about that. It’s just a different angle. Where can people go, Doug, to get more information about your website or your show? Doug: SpousesFlippingHouses.com. That’s our website. You can get information on the show there. We also have some projects that we’ve done and some blog posts and things like that. Joe: Excellent. Okay, cool. And SpousesFlippingHouses.com, we’ll have a link to that in the show notes. If somebody is interested, Doug is maybe in the Southern California market and is may be interested in partnering with you on some deals. He maybe wants to lend you a bunch of money. How can somebody…? Is that still a good website to get you at or should they look up SoCal Home Buyers? Doug: Yeah, they can go there, or they can go to SoCalHomeBuyers.net, not .com, .net. Or they can e-mail me at: Doug@SoCalHomeBuyers.net. If you want to reach out, please do. Joe: Yeah, awesome. Well, thanks, Doug, for being on this show. We really appreciate it. And Andrea, tell her hello for us and we wish you guys the best of success with the podcast. I’m looking forward to hearing it and listening to it. And I encourage everybody else to check it out. Hopefully by the time this podcast is released, we… You’ll see Doug on the Podcast airwaves as well, very nice. Doug: Well, thank you, Joe, I really appreciate the opportunity to be here and it was a good time. I appreciate it. Thanks, Alex. Joe: All right. Thanks guys, see you.